Show presence: A Japanese Bobtail cat that can be handled by strangers, who loves to travel makes the best foundation for a loving companion cat in your home. Genetic vitality: Japanese Bobtails have a small gene pool. Kurisumasu Japanese Bobtails has imported from Japan and combined with our own lines helps to help maintain their vigorous health. Kurisumasu JBTs are FeLV/FIV negative and have had their kitten shots. Exquisite type: The show cat is judged to a written standard. 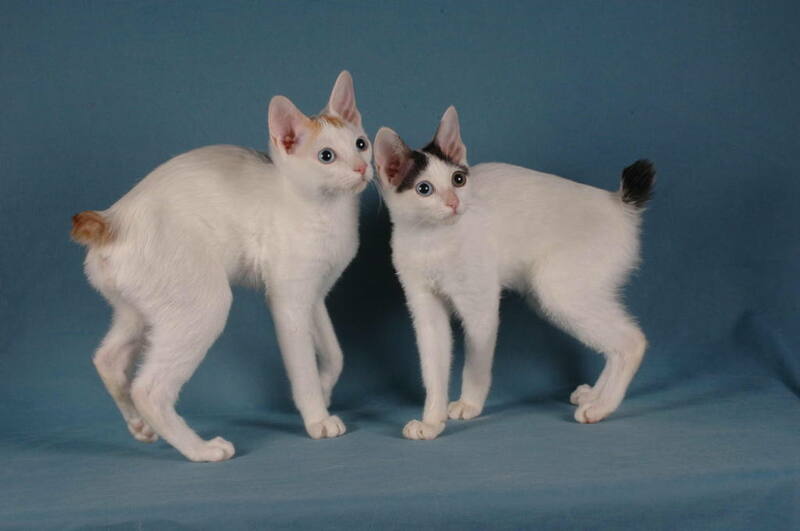 Kurisumasu Japanese Bobtails that are sold as show cats meet this standard of perfection. These are Japanese Bobtails that we would be proud to show. Companion cats may have a slight flaw, but will not detract from their overall balance and type. Rainbow of Colors: Our Japanese Bobtails come in flashy patterns, intense solids, pale dilutes, bold tabbies, traditional dramatic colors of red, black and white, with blue or odd-eyes and smokes and silvers! Longhair or Shorthair Japanese Bobtails: Non-matting medium Long coats that do not hide the body, but accentuates the angulation of legs, the sculpted head and the beautiful pom tail of the Japanese Bobtail. Shorthairs with silky medium short coats. Both lengths are easy care with slight shedding. Japanese Bobtail Kittens and retired show Japanese Bobtail cats available. Warning! They may be addictive! We reccommend a companion for your JBT as they love people and other JBTs! Check our Japanese Bobtail Available Kittens and Japanese Bobtail Available Retirees! !